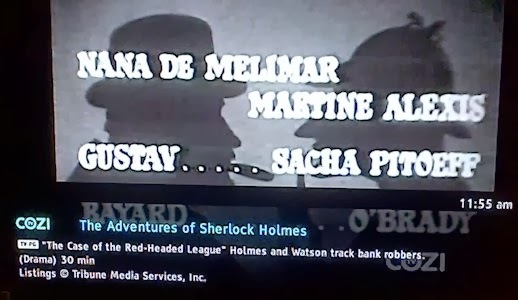 This was the guest cast listed for the 'Sherlock Holmes' episode "The Red-Headed League". None of these three characters were in the episode. The episode in which these actors appeared was actually "The Case Of The Eiffel Tower". At least two TV characters have appeared on the show, (Joey Tribbiani of 'Friends' and one of the 'Girlfriends') which makes the version seen in Toobworld a different show from the one seen by the Trueniverse audience. Rachel: I am so proud of Joey, I can't believe he's going to be on 'Law & Order'! Phoebe: I know. But don't you think that it should be called 'Order and Law'? Rachel: No, because first they arrest the guy and then they try him. 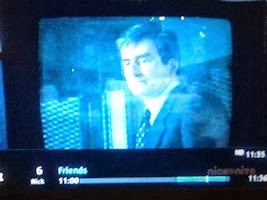 Grandma Tribbiani: No, it's Sam Waterston! "Crimes and Misdemeanors", "Capricorn One". Chandler: Doesn't know "Hello." But she knows "Capricorn One". On an episode of 'Psych', Shaun and Gus had a discussion of the actors who played the D.A.s over the years. One was Angie Harmon and they threw in the cop played by Mariska Hargitay as well. (Those horndogs!) Then there's 'The Sopranos' mentioned one of the show's producers, Rene Balcer! And as so often happens in Toobworld, the actors are cast because they look so much like the real people portrayed in the shows. In this case, Sam Waterston landed the plum role because of his amazing similarity to Jack McCoy. So no more splainin my way around it. It'll be a lot easier around Toobworld Central now that I've accepted it. Last year when Inner Toob was running the daily showcase for the League of Themselves, Shaaron Claridge was featured on July 30. 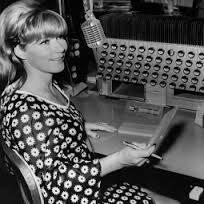 She was the voice you heard in every episode of 'Adam 12' as the police dispatcher. Producer/star Jack Webb wanted that voice to have an air of authenticity and who better than an actual dispatcher for the LAPD? But that wasn't the only L.A.-based TV show in which Ms. Claridge made a vocal appearance as a police dispatcher. In a perfect Toobworld, it should just be accepted that all of those shows are in the same reality, in the City of Angels to be found on Earth Prime-Time. But a trivial link like the voice of Shaaron Claridge makes it a legitimate connection. And that's why Shaaron Claridge is one of our inductees into the Television Crossover Hall of Fame this month. Welcome to the Force, Ms. Claridge! When such events are repeatedly hashed over in mini-series and TV movies, Toobworld Central just ships them off, each to their own alternate dimension of the TV Universe. That way we don't have to wrestle with the thorny Zonks like Recastaways. However, we have to find splainins when those events are woven into episodes of the TV series which are the foundation of Earth Prime-Time. As I mentioned, Recastaways are a particular bugaboo for the Splainin Department, but we've come up with a reasonably good excuse - historical figures may look different from one series to the next because the Truniverse audience is seeing them from the perspective of one of the other TV characters in the storyline. A recent example would be Edward the VIII, the British king who abdicated the throne for the love of Wallis Simpson. My personal preference as to his portrayal would be that by Edward Fox in the mini-series 'Edward And Mrs. Simpson'. But his appearance in TV series like 'Dancing On The Edge' and 'Tales Of The Gold Monkey' would take precedent. 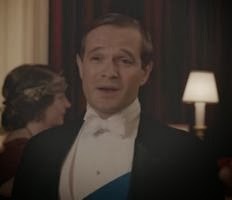 In the current season of 'Downton Abbey', he appears as the Prince of Wales alongside his father, King George V. A different actor plays him than seen in those previously mentioned series, so it's splained away as being the point of view of Lady Rose MacClare who was being presented to the Royal Family. 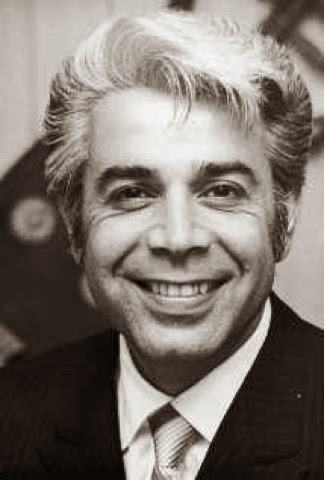 Jerry Vale, a smooth-voiced singer who reached the top of the pop charts in the 1950s and '60s with his interpretations of romantic ballads, died Sunday at his home in Palm Desert. He was 83. Vale's attorney, Harold J. Levy, confirmed his death after a long illness. If I don't induct the worthy (if not urgent) candidates into the Television Crossover Hall Of Fame upon learning of the relevant death, I tend to forget. So that's why the televersion if Jerry Vale is joining the TVXOHOF in a month usually reserved for the Queens of May. Vale's presence in these TV shows has no connection to his portrayal of himself in movies like "Casino" and "Goodfellas". Those "cineversions" do make him a Multi-versal, however. 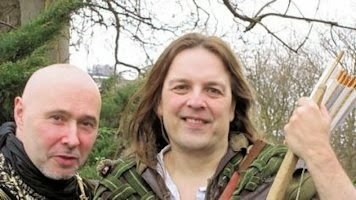 TUESDAY NEWS DAY - "NOTTINGHAM"
with Tim Pollard, a Robin Hood impersonator. Yet another TV dimension will be getting its own version of the Robin Hood legend. And that makes sense, since the network suits won't have to shell out any of the potential profits to a rights-holder. One other Robin Hood TV series I did watch - "When Things Were Rotten". It didn't matter if it was in Doofus Toobworld; it was by Mel Brooks! "Nottingham centers on the Sheriff of Nottingham whose wife is killed by King John’s men. When nobody is brought to justice, the Sheriff launches a one-man war against the Crown. By day, he remains the reviled Sheriff, loyal servant of the King, but by night he puts on a hood and, using the intelligence he gains from his office, attacks the King where it hurts the most — his coffers." The series will be called 'Nottingham'. So with the penultimate episode of 'Warehouse 13' last week, it looks as though the Warehouse will be on the move to its new location in the series finale. Benedict Valda tried to move it to Beijing, so perhaps that's where it's predestined to go. 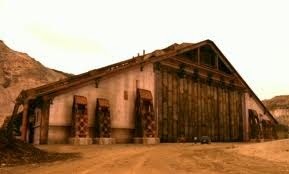 In the past, whatevever mysterious powers control the Warehouse (or if the Warehouse is a living entity, sort of like Moya the spaceship of 'Farscape'), it was decided that the Warehouse would eventually go to the next country of great development. So the choice of China would probably make sense. But what if the Warehouse decided it was time to think of Earth Prime-Time as one global community? Wouldn't it be a better choice for the Warehouse to position itself in a place accessible for all Mankind? Personally, I would love to see the Warehouse take up residence in the Arctic Circle. And it wouldn't have to be specifically spelled out, but perhaps it could occupy the carbon footprint of Superman's Fortress of Solitude. In Earth Prime-Time, he no longer has any need for it... being dead. That's just my wish-craft, however. We'll find out later tonight with the series finale! The latest Aflac blipvert is actually a flashback to before the middle of 2007. That's when New Jersey mobster Phil Leotardo was killed in a hit at a gas station. So I would place the Aflac Duck's abduction by Leotardo probably in the Fall of 2006. And I would not be surprised to find out that big goon of a henchman was some kind of Wesen from 'Supernatural'!